As the UK bakes in record-breaking temperatures RBTH's London events calendar for July has the coolest cultural tips for the month. Ranging from an exhibition of a Russian conceptual photographer exploring the immense diversity of Russian nature, to Prom 5 at the Royal Albert Hall dominated by the music of Igor Stravinsky, there's something for all art lovers. Photographer Sasha Gentsis experiments with landscapes in 'Photoduets' where he juxtaposes images taken in different parts of the world. Known for his panoramic images, Gentsis is now taking his work into a more conceptual realm with his show at the Rossotrudnichestvo representative office in central London that features a new and unusual collection of art. The project consists of images drawn from three collections: 'Duets World', 'Russian Duets' and 'Winter Duets'. More than 100,000 people attended 'Russian Duets', when those photos were shown, a record for Gentsis. In the new collection, the photographer explores the essentially dualistic nature of life through the similarities that can be found in completely different shapes, colours, materials, textures, places, emotions and concepts. "I wanted to prove that the same content, if it is put in a different context, can completely change its meaning," Gentsis says. “Two of my favorite photographs duets: 'Arches', where you can see how the lower image complements the upper, shows the wild beauty of Sakhalin Island and 'Mausoleums' - a double exposures of the Taj Mahal, which is reflected in the water - perfectly embody my concept." A wine tasting organised by Pushkin House, the Russian Cultural centre, is scheduled for 9 July. Wine, cheese, and the Russian language – what’s not to love? "We are delighted to welcome wine writer and teacher Tanya Nesterova, who returns to Pushkin House for London’s only Russian language wine club. This month, a warm weather special – summer wines and cheeses," says Katie Sheppard of Pushkin House. All the guests will be guided through combinations of six perfectly selected vintages and half a dozen mouth-watering cheeses from Covent Garden's Neal’s Yard. The event is in Russian, with English translation. Struggling to find the finishing touch to your cultural feast? Plunge into the beauty of bright, folklore motifs at Prom 5: Haydn, HK Gruber and Stravinsky at the Royal Albert Hall on Monday, 20 July. This year the BBC Proms celebrates the 120th anniversary of the national musical extravaganza, presenting to a global audience a broad range of music performed to the highest standards. From Wagner and Beethoven Nights to concerts of leading composers of the early 20th century including Richard Strauss, Debussy and Rakhmaninoff, impresario Robert Newman and conductor Henry Wood established a great tradition of symphony orchestra concerts. Today, BBC Proms continues to welcome leading international performers. Since its earliest days, this unusual music festival has upheld a tradition of keeping ticket prices low to create a unique platform for the contemporary composers, electro-acoustic musicians, jazz and even gospel. And the upcoming event is no exception. 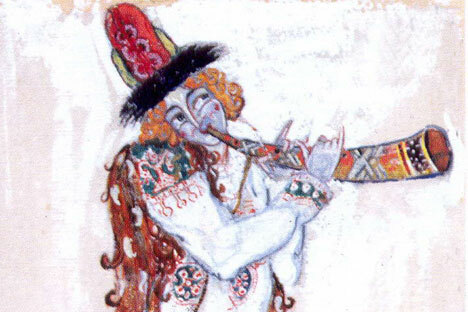 The audience at Prom 5 will have the unique opportunity to listen to the composers of Diaghilev's Ballets Russes with a 1911 version of Petrushka conducted by John Storgårds, combining a score by Stravinsky, Haydn and HK Gruber. Instruments from Thailand, Africa and South America spice up the ballet classic.